whenever someone sits to meditate with it. All malas are blessed by Ken and Elizabeth. 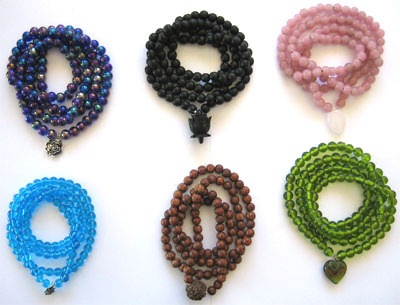 Elizabeth makes these malas, then Ken and Elizabeth both meditate with them in order to charge them with their awakened energy. From then on, whomever uses them will benefit from that wonderful charge. They are available in two sizes: 108 beads and 54 beads. The standard colours are blue, pink, green and an iridescent purple with shots of colour through it a little like an opal. Expand the picture and look at the right-hand and left-hand columns. You can choose a colour, too. We will do our best to get it, although we cannot guarantee that we will be able to. Enter the colour you want in the "Type colour box" box.